There will be yoga, mimes, massages and bikes but no cars on Mission’s main roadways today for Sunday Streets, a recurring event put on by the City of San Francisco to encourage healthy living. The 2.2 mile L-shaped route from Duboce Avenue and 24th Street to Hampshire and 24th will have many attractions and is expected to draw over 50,000 people. Many of the attractions are bike-oriented. REI, Mike’s Bikes and Mission Bikes will be offering free repairs. Ybike will stage a bike rodeo for bike-riding children, ParkWide Activities LLC will offer free bike rentals and the Sisters of Perpetual Indulgence will top it all off with a blessing of the bicyclists. If your body hurts after all that biking, have no fear: Mission Yoga, Laughing Lotus Yoga and the Integral Yoga Institute will provide free yoga classes, and free massages will be offered by the San Francisco School of Massage. There will also be mimes, music and many other things. Here’s a map with all the times and locations. Parking will be available at Mission Bartlett (90 Bartlett) and San Francisco General Hospital (2500 24th St.) parking garages. If you arrive before noon, the all-day parking rate is $10. Starting at 7 a.m. all cars along the event route will be towed. One of the more important happenings of the day will be a fundraiser at Casanova Lounge from 3 to 6 p.m. for those displaced by the May 6 fire that damaged two buildings at Valencia and Duboce. To donate now, click here. 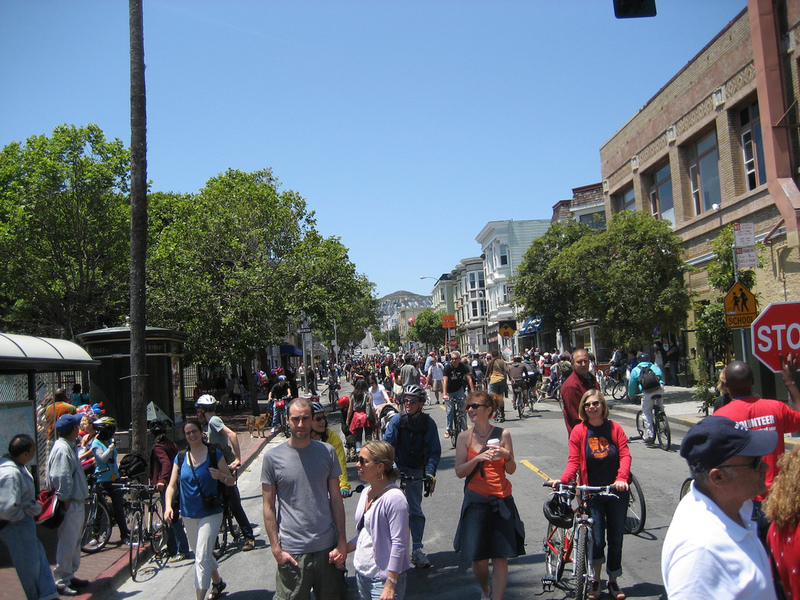 Sunday Streets will take place from 11 a.m. to 4 p.m. on Sunday, July 1.